I've been looking for a good solution for roads for my Flames of War table for a while. I built some wood based roads that took up too much space to store. I used brown felt but it looked flat and boring next to my other terrain. These roads are scaled to work with 15mm scale vehicles but you could easily adjust the dimensions for 6 mm to 28 mm scale models. My key criteria for this project was that the roads must be easy to store, cheap, and modular. The total project took me about an hour to cut and paint. They fold up and store very easily. The total project cost $4 for felt and used a little paint. The roads in use in a bloody game against Geoff at the tournament in Kelowna. For 15 mm scale I cut my road sections 2.5 inches wide. I found that 3 inches looked too wide and less than 2.5 inches looked a little too thin. I cut a few sections that were the full 36 inches long. I used a few bits to make a T and four way intersection and then used scraps to make a few small curves. I cut each piece of felt with some sharp scissors. Curves and intersections add some nice variety and add to the modular nature of felt roads. I did a little research and found that WW2 roads in Europe were all white lines. I think these are sort of right. I made a little template that was roughly to scale (probably a little large) for some dotted center lines and some stop lines. I cut them out of card with an exacto knife. I airbrushed grey on the edges of each piece and in a light overspray to add some depth to the roads. The grey helps them to look a bit more interesting. I darkened each edge and added some weathered patches in the dark grey. I used the template from Step 2 to airbrush lines onto the roads. I lay the template on the felt and quickly sprayed a little white paint for each line. They don’t need to be too perfect. I added some stop lines at intersections and used the single line template for corners. To add interest, I added some dirt using some dirt brown colour sprayed through my airbrush. I added a few dirty spots and lightly airbrushed some dirt in places. Don’t add too much of the brown. That’s all there is to it. I didn't bother sealing mine. If the paint eventually comes off I will just repaint them. In total it took me about an hour to make them and they look decent on the gaming table. I hope this is helpful and allows someone else out there to build some cheap and cheerful felt roads for their wargames. By adjusting the scale you could use this basic design for everything from micro armour to 28mm Warhammer 40k games. I have some more terrain posts coming up over the next month on Rust and the City. 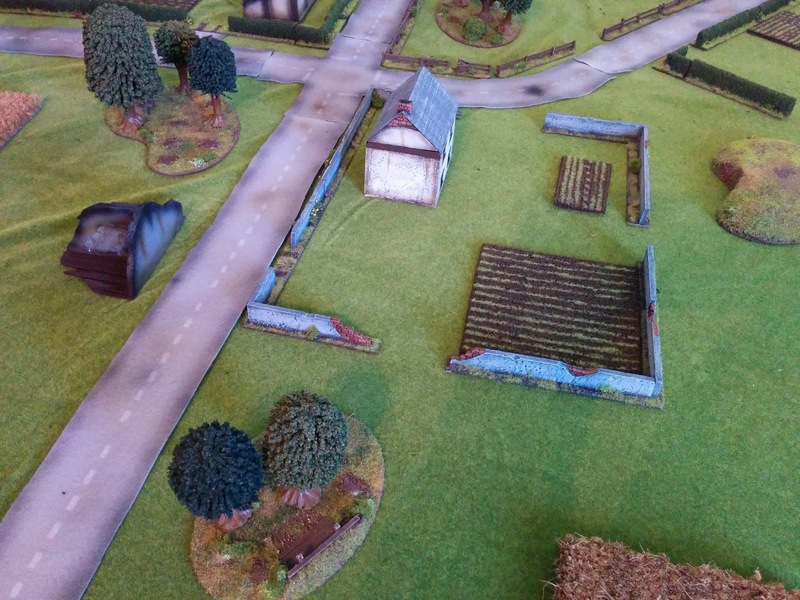 Visit again in the next few weeks for some autumn trees, another style of roads, a hill, an overview of my tournament tables, and my thoughts on Flames of War terrain. Thanks for visiting! Great tutorial, I need to get going on my own terrain tiles . Thanks for taking the time to post . Thanks furphy. These roads are nice and easy. I'll look forward to seeing your terrain tiles! That's awesome!!! Looks like I'm taking a trip to the craft store very soon! How well does the felt stick down to the grass mat? I feel that the 'velcro' effect would make this even more effective and I'm a big user of the grassmat. Otherwise, because I'd be using it for 40k, should I glue and pin the roads to carboard scraps to make it more solid? They really stick very well to the grass mats. I'd try them as is and gluebthem later if you decide you need them to be more solid. Really good looking roads there, thanks for sharing! Thanks for taking the time to reply Paul! I hope this helps others to make some cheap roads. It looks so simple and beautiful...excellent tuto! I need you to make me some of these. Haha. Okay. I still owe you for those two panthers. I could make you a set in trade for those. I'll email you. What kind of felt did you use?